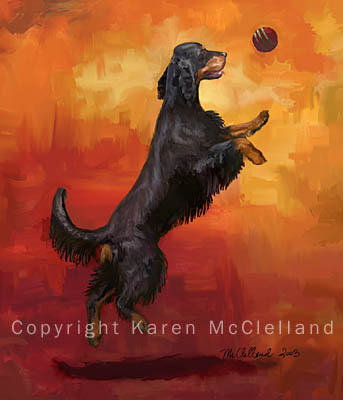 Gordon Setter limited edition print by Karen McClelland titled "Catch" ""
Gordon Setter dog print titled "Catch"
Mid-air, tail wagging, and going for the ball. See the closeup below the edition info. Image size 12" x 14"
Printed on: Canvas with UV protective coating. This print is Gallery wrapped. 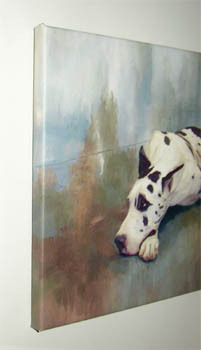 That means the painting goes beyond the 14 x 12 dimensions, and is attached to stretcher bars. 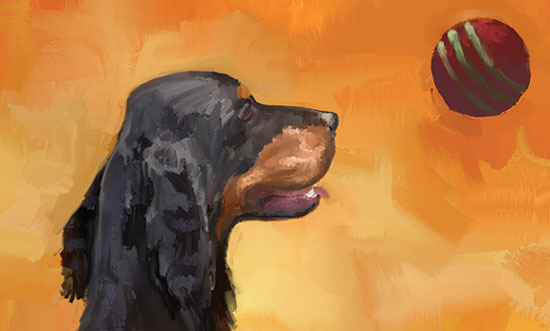 Therefore it can be attractively hung without a frame, or can be traditionally framed (see photo example below). The image as shown above is 12 x 14 and does not show the additional printed area that would be wrapped around the bars.